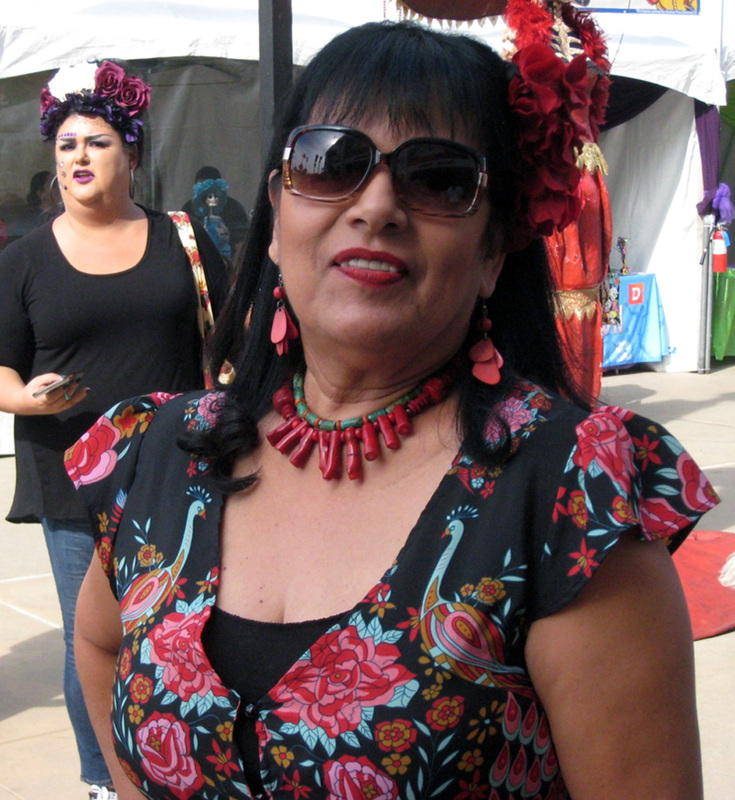 Carolina is the face and heart of Downey’s Dia de los Muertos, one of the most popular festivals in Southern California for the Day of the Dead. 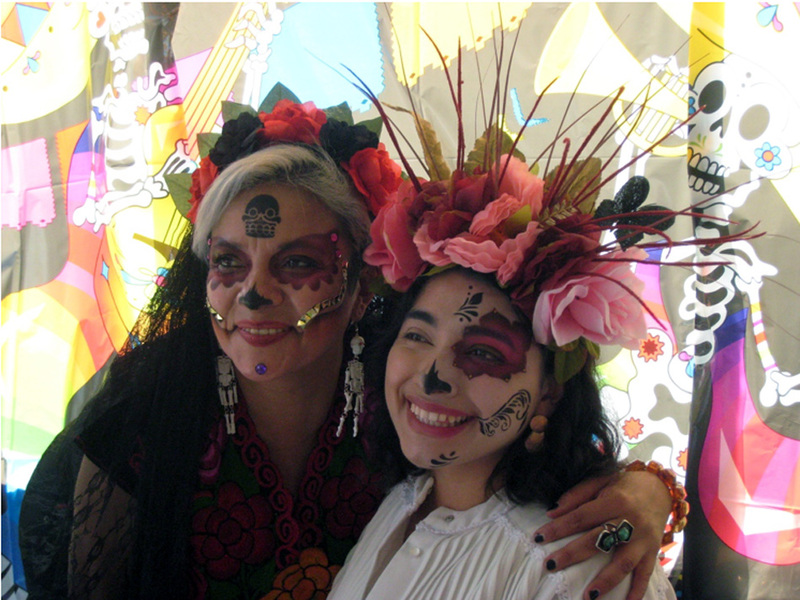 El Dia de Los Muertos is a family affair, a celebration of life and a time to honor those generations that have already passed. That dancing skeleton in black lace mantilla and roses? She could be your abuela. That skeleton in a black top hat and cane? Tio Marco. Not everyone gets that kind of encouragement, but then not everyone puts as much time and effort and love into making something like this festival work. Say “Hallowe’en” in Europe and visions of mist at midnight or the chalky rays of a ghastly ghostly full moon are conjured up, with witches and goblins, stranger to all the villagers, casting evil spells and kidnapping children. Or worse. But one of the most distinguishing customs of El Dia de los Muertos is the building of the altars, to honor specific deceased and beloved family members. It’s two different ways of marking that death is coming, customs as opposite as a sunny family fiesta is from the story of a vindictive hag, the Cutty-Sark, pursuing Tam O’Shanter at midnight over the Brig o’Doon. Different strokes for different folks and their folk-lore and traditions. Carolina, who was born and raised in Nyarit, Mexico, said that the altars, or ofrendas, are the most prominent feature in a Dia de los Muertos celebration. So many people and organizations came to Downey to share that passion. The Avenue of the Altars, curated by Carolina, was nestled in the green space in front of City Hall. 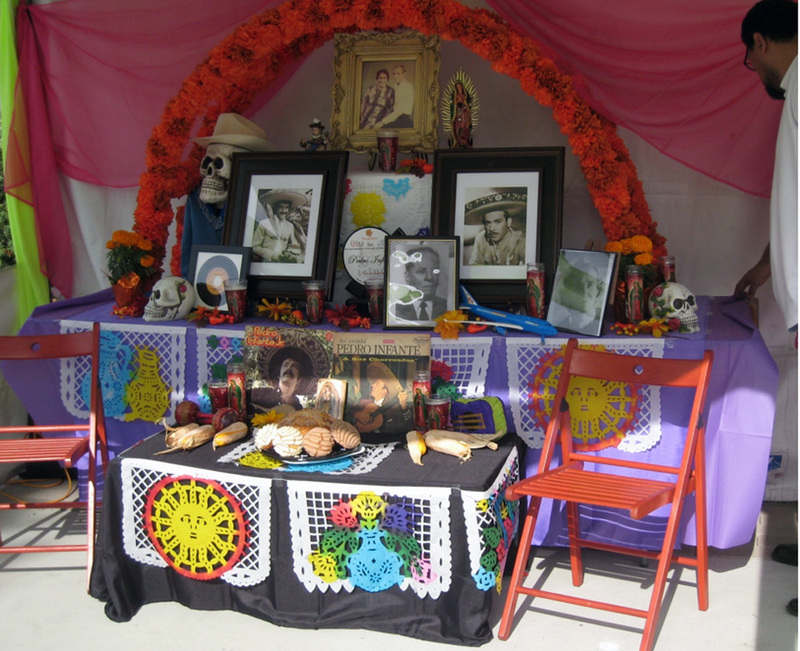 Lupita Infante’s altar, paying tribute to her father and grandfather. The marigold is the flower of the dead because its brilliant sun-gold color and pungent odor, which are said to lead the souls of the dead to the festival. The marigold-strewn altars had photos of the ancestors when they were young, as children, and as they grew very old. The favorite foods of the deceased are cooked and placed with sweet bread, and fruit drinks and shot glasses of tequila were placed on the altar table, with candles, which Carolina said were one if the most important parts of the altar. Mementos like a prayer book and beads, a doll or lucky coin sit between skulls wearing sombreros. Luminarias are printed with the name of the deceased and the life data. Stepping onto the Plaza in front of the Downey Theatre, one saw a kaleidoscope of colors and much larger-than-life figures made from painted papier-mache, sent by Tios Tacos in Riverside. There were giant bicycles and voluptuous women with skeleton features and boney hands in lace mittens. Families posed for pictures beside the characters, mothers with little children, grown men, teenagers. The first booth encountered inside the Plaza in front of the Downey Theatre on the Firestone side was run by a mother and daughter team from the Soroptimist Club of Paramount. Soroptimist means best for women and children, and the Paramount and the Downey Club sponsored the booth. Paulina and Cecilia Gonez, both with their faces painted beautifully and wearing crowns of flowers and feathers, handed out informative flyers about Soroptimists, women who speak out against domestic violence and human trafficking. Soroptimist of Downey is holding a session on education and awareness of these epidemic problems on Thursday, Nov. 8, at 5:30 p.m. at Los Amigos Golf Club. Cecilia Gonez and her daughter, Paulina. Everywhere the theme was life happily mingled with death, the dead and the living. Young girls had faces half painted, one side a blue and white skull, the other as alive as when they woke up this morning. The art show, curated by the Downey Arts Coalition (DAC), emphasized this theme. Rosa Ma. Alvarez displayed embossed and painted tin plaques of skeletons and skulls in silver and gold, circled in a repoussée frame. Jorge del Toro’s boney skull sculpture was painted bright red and blue and green, and black and white. Lights twinkled from within the cavity. The piece was untitled because “I don’t like to limit the imagination,” said Jorge, fresh from his adventure with the baby falcon. Art Montoya manned the DAC table, and told us he graduated from UC Irvine but is now a law student La Verne, trying to decide on what kind of law to practice. He exemplifies the young people who are active in the recent renaissance of the arts in Downey. Organizations with booths with information and congratulations were set up by Avenue Printing, Downey Adult School, Downey Federal Credit Union, and the Downey Symphony. More specifically to the point of the interests and needs of the patrons, the Los Angeles County Registrar/Clerk’s office had a booth offering voter registration forms, and information about the new voting laws that take place in 2020. Michele from Norwalk, who works for the county, wore a pair of earrings with long bony fingers dangling from pink roses in her ear lobes. Greg Welch, who with his wife Barbara Risher Welch, operates the independent, family-owned Risher Mortuary and Cremation Service in Downey was one of the thousands walking around the exhibits. Greg goes on humanitarian construction missions around the globe with Downey Calvary Chapel, and also has time to act as this year’s president of the Rotary Club of Downey. Now it was time to sit down inside the Downey Theatre and enjoy folklorico dancing with the Resurrection Group. Children danced, their faces painted chalky white. Then women came out in long white flounced dresses to do the ribbon dance, soon joined by men in overalls and caps and red scarves. The next number started as a devil figure in red with horns faced off with an angelic dancer in blue, soon joined by women in the long traditional skirt and men in red and blue serapes and sombreros. Women in the audience also dressed in the graceful long Victorian dresses, with bustles in the back and everyone had flowers in her hair. Every seat in the auditorium was taken, and enthusiastic applause greeted the end of each number. Regions of Mexico were represented, like Chiapas and Jalisco. A final tribute perhaps derived from Aztec Mexico City had girls in white with pastel stoles of pink, blue and mint pantomiming the throwing of flowers to the audience. Then a short animated art film was shown, El Trompetista, about a little cadet in a gray army band who plays a red hot trumpet, which lands him in jail where the notes he plays come out blue. His opponent, a sadistic drill sergeant who plays square notes and looks like Lee Marvin on a really mean day, has no chance against the creative power and individual spirit of the boy. Finally, all the cadets trumpet notes of the purest colors and patterns and designs, and the bright band marches off into a pink and gold sunset. The film, from Mexico, was experimental in style, with no frame to the picture, the screen black except for spotlighted and side-lighted figures. In Spanish with English subtitles, it was directed by Raúl Robin and Alejandro Morales Reyes and written by Raúl Fuentes. The parking lot in front of the library had been turned into a pedestrian mercado and a corridor for food trucks. The library had displays of Frieda Kahlo and Pabla Neruda’s sayings. 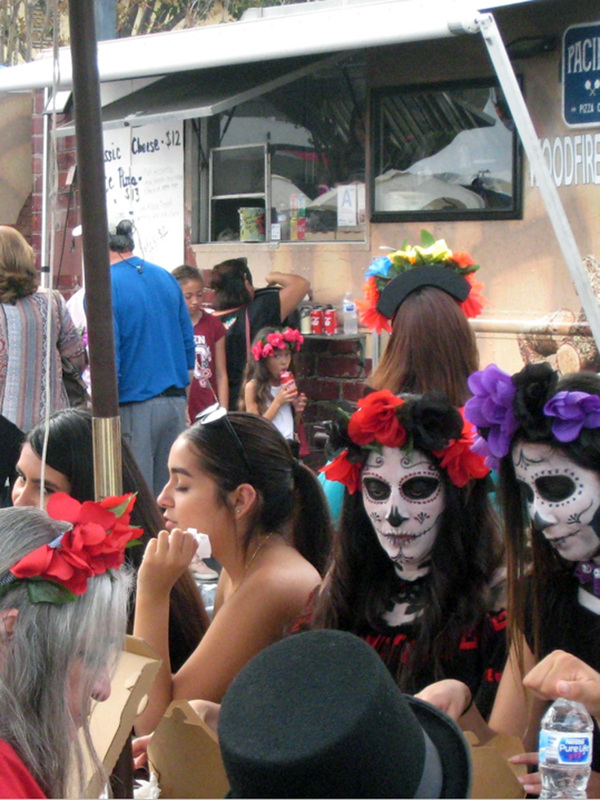 As the day went on more and more people appeared with their faces painted like skeletons, the women and girls with jaunty floral wreaths and dangling earrings, sitting at the benches beside the food trucks, posing for pictures with each other. One could buy an embroidered flowered dress here without having to go all the way to Oaxaca to find one, or get a miniature wedding party of figurines dressed in lace and satin, feathers and pearls; bouquets, top hats and tails; a complete maricachi band with tiny instruments; bright party dresses and miniature boxes of juice to drink – all skeletons. Music was playing, little girls were coloring chalk pictures on the sidewalk on the Embassy Suites side of the plaza, under pink-flowered trees, or sitting on a carved wooden throne with a peacock feather crown as again the family took pictures. Although the space became crowded everyone was cordial and polite, making room for young parents with babies in strollers or older people navigating with a walker. It was definitely fun and fiesta, as promised, with the emphasis in family. Next year will be even better, if Carolina del Toro and her team have anything to do with it.